Everton came to White Hart Lane unbeaten since before Christmas. Tottenham returned to a ground they've not lost at all season. The overall stats alone made this a game to pay attention to for the neutral, for a supporter of either side this match was crucial. Everton needed to take advantage of United’s poor performance at home to Bournemouth, they needed to shut the gap and keep the march on for the top 4. Spurs needed a victory to create some breathing space between them and third place Liverpool as well as catch up on league leaders Chelsea. The first half was a typical home display from Tottenham. Strong going forward, comfortable defensively and all over possession. All though at times the build up play was overplayed or slowed down to the annoyance of the spurs faithful, it was mostly a wave after wave situation. Everton managed to break forward on a few occasions, but were contained efficiently by the home side. Then along comes Harry Kane to once again momentarily silence numerous critics. 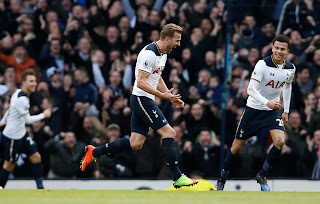 He received a fine pass from Ben Davies, held off a defender whilst protecting the ball from an oncoming 50/50, turned back towards goal and sent a ball 35 yards into the bottom left. Joel Robles left for dead, along with Williams and Co in Everton’s defence. A sublime effort from a truly unfathomable talent. After Spurs opened the scoring it only became tougher for Everton. Multiple dangerous attacks from the Lilywhites, penalty claims and balls hitting the post all added to Koeman’s stresses. As the ref blew up for Half Time it was almost astonishing that it was only 1-0. The Toffees could have been facing a 2 or 3 goal margin at the break, and you could only imagine that changes would be made by them during the interval. They weren’t. Everton returned to the pitch surprisingly unchanged. No sites of the likes of Mirallas to bring a new threat to left back Ben Davies just yet. Instead Koeman opted into persevering with the current 11, hoping that the break would have ripped Tottenham’s blistering momentum apart. He wasn’t too wrong. The beginning of the second half wasn't as elegant from Spurs, Everton were keeping hold of the ball better than they did in the first 45. They were also pressing more so than in the first half. In fact they looked well matched until Walker fired a ball across the pitch to Robles, who thoughtlessly threw it towards Schneiderlin. It took Kane, Alli and Dembele no time to shut down Schneiderlin’s panicked touch to William’s. Dele Alli playing a swift ball through to Kane, who then comfortably buried it past Robles. At that point it seemed game over. Spurs once again took control of the game, even Davies looked more comfortable on the left side than previous performances. However, a decent ball through to Lukaku and Vertonghen losing his balance means Everton pull one back with 20 to go. Once more the visitors pushed hard to get back into the game but offered little as the final whistle drew closer. Winks coming on for a booked Dembele gave him the opportunity to provide Alli with a beautiful cross from a very late free kick. The inswinging ball from the edge of the area, followed by a clever touch from our number 20, meant it was 3-1 in the 93rd minute. It was a brave call from young Winks, who may have been inclined to play it short into the corner flag to run down the clock. Instead he displayed his promise with an imaginative attacking ball. Then it all went blurry, somehow it was 3-2 and the final whistle went, to put it bluntly. The scoreline flatters Everton to some degree but shows their ability and attacking threat. With not too many opportunities to break down a strong Spurs defence they had to really convert any chance at goal they had-. To score 2 of their 4 shots on target is impressive, no matter if the game was gone by their second. With this win Tottenham secured their 9th win in a row at the Lane, a new club record. Spurs face Millwall at home in the cup this coming weekend. Let’s hope the boys can continue their brilliant home form!